Today's post kicks off a whole bucket of reviews I have lined up for Tsubasa Masuwaka endorsed beauty products (both Candydoll and Dollywink items) because I have just been obsessed with trying out products from her lines recently. It started off with one little blush and has now grown to a pretty solid stash (as seen on my Facebook). 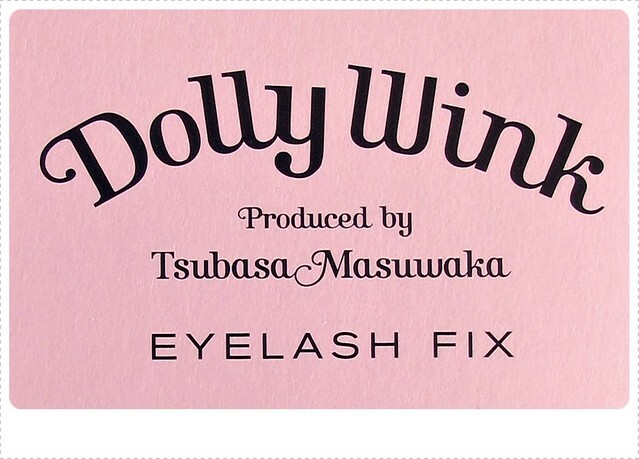 I thought I'd start off this round with this Dollywink Lash Fix which is one of her best selling products right along those famous false lashes. Availability: eBay, Amazon, Ichibankao or local Asian market/beauty shop. Having been a false lash lover for years, I've come to accept that there aren't very many options for lash glue here. You're either an Ardelle Lash Grip girl or your a DUO lash glue faithful (see my comparison review here) but there were certain things about both these items that drove me nuts. One was the smell and two was the fact that they tended to separate after a while, leaving you with part liquid and part latex glue. 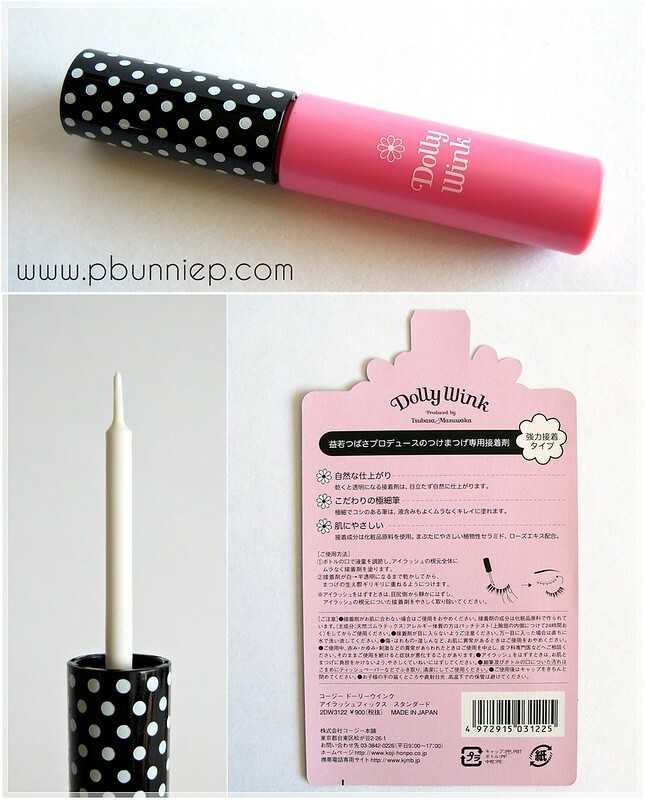 Dollywink's lash fix comes in a bright pink polka dotted tube and stands just a little over 9cm tall. This is actually their second lash glue release, part of their Otona collection (the original was a light pink tube) which came out together with the new series of Otona lashes. As you can see, the tube comes with a slim brush tip applicator great for easy and precise application. Not that I should be sniffing glue but I'm excited to say that this has a faint sweet fragrance instead of the usual latex odor so problem #1 is resolved. And since the glue comes in a plastic bottle, you can shake it up to prevent any separation which takes care of problem #2 as well. The variation I own comes out white but dries clear and there is an alternative black version similar to the DUO dark glue. Now while all that sounds fine and dandy, I can't get myself around the texture of the product. The liquid is very thin in consistency and the margin between "I'm too wet and won't stick" and "I'm too dry now, try again" is slim. I find there is really only 10 seconds when the glue is just tacky enough to stick with one touch and even though I feel very comfortable with applying false lashes, I'm constantly re-doing or making adjustments when using this product. Due to the formulation, this would be better suited for very lightweight invisible/soft backbone lashes (like her own lash range) rather than the stiffer hard backbone falsies because its just too difficult to work with the runny consistency and lack of tacky power. Once on, the glue appears to be water/oil resistant and holding power is average but not waterproof so it's best to save it for casual wear. It also seems to have a lower latex content and is harder to peel/remove from your false lashes afterwards so use a little makeup remover to help it out when cleaning your lashes for storage. Overall this is something I'd keep in my makeup bag for touch ups when parts of my lash strip come undone because I can apply the glue very precisely onto the lifted parts without having to remove the whole strip and starting over. It's a good beginner product for everyday and is very gentle on the eyes but won't hold you through a big event or a photo shoot so you might want to keep your DUO close at hand. Tried this? Share your thoughts! I really like the packaging! So pretty!